Posted October 28, 2014 by admin & filed under Student Awards. Paul`s project title is “’A is for Android’, an interactive learning application for early learning ”. From left to right. 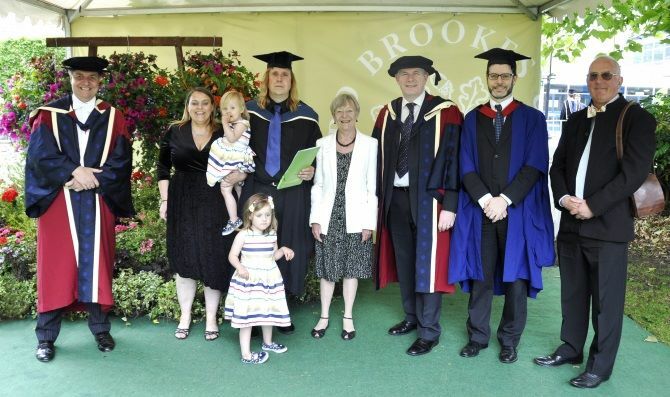 Dr Tom Shannon, keynote speaker at the graduation ceremony, and our speaker on 12 February 2015, Mrs Oliver and children, Paul Oliver, Sheila Lloyd Lyons vice chair BCS Oxfordshire Branch, Dr Nigel Crook, Head of the Department of Computing and Communication Technologies, Peter Marshall, Programme lead for Undergraduate programmes in Computing and Communication Technologies, David Lightfoot, Senior Lecturer in Computing.